My MA research dealt with the meaning and place of contemporary Australian Aboriginal paintings as ‘intercultural objects’. 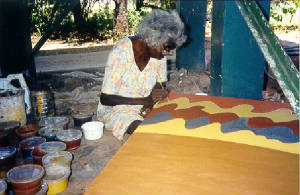 I conducted fieldwork in the community of Warmun (Western Australia), where the art centre was my main research setting. My special interests were the use of artworks in socializing younger generations (a subject which has not been studied much yet), and their changing status when entering the global arena. I found that there is not one way of looking at Aboriginal art, that meanings attributed are socially constructed and change over time. By following individual artists and their works as well as their encounters with the western world of art galleries I have brought into view the ongoing dialogue between these two worlds and how it effects the way Aboriginal culture is represented and perceived nowadays. From September 2002 until January 2003 I was in Warmun Aboriginal Community. The community's art centre, Warmun Art Centre, established in 1998, was where I spent most of my time. My initial interest was in how Warmun artists use their paintings to communicate local knowledge and cultural identity to the young generation. The topic of Aboriginal art and socialization has not been given much attention to in literature on Aboriginal art, and the communal nature of the Warmun painting movement has been particularly neglected. Yet I soon realized that concentrating on just this theme gave too narrow a view of what these paintings really were: intercultural objects. Warmun art is produced for the market and I had to take this into account into my analysis. Indigenous art has entered the 'global arena' and its meanings cannot be reduced to the local. While I did focus on the interactions between elders and young people and followed some novice-teacher relationships closely, I have also given attention to the wider context the painting took place in. Especially the presence of the non-Aboriginal art coordinators and how they 'influenced' the artists, and the opinions of visitors (usually tourists) to the art centre had my interest. Interactions between Warmun artists, academics and the public during a symposium of East Kimberley art in Sydney, have also been very interesting in understanding how culture is made in different areas. I have approached 'culture' as something that is not set, but is constantly in change. It is made in social action. It is in everyday contexts that the anthropologist gains insights in the actors involved in 'culture making' and in their motives. Following Moore (1987) I have treated my fieldwork as 'current history'. Social reality is fluid and indeterminate and what the anthropologist may observe at a certain time may not be valid for the future. Especially in the symbolic world of Aboriginal art, where meanings are constantly negotiated, there are no set standards. In my view, anthropology should have a value that transcends the boundaries of the academical world. It should be engaged with the real problems in this world. Anthropology's concern with the daily life's of normal people makes it an excellent discipline to show that all 'common sense' is socially constructed and that there is no legitimacy to believe in the superiority of one common sense above another. The aim of the discipline should be to enhance cross-cultural understanding and to cross bridges, in order for a shared humanity to arise. My own (applied) concern is with the protection of indigenous peoples' cultural heritage (including land rights and intellectual property). I am very interested in how societies and cultures influence and borrow from each other. In the current ecological crisis we are facing as a world population I believe it is immensely important we develop alternative ways of perceiving our environment and can turn for that to indigenous peoples, without essentializing them.